It’s Thursday, it’s raining, I’m cold and I’m grumpy. Why am I grumpy? Well l’m bored and have been ordered to stay in bed after I fell last week and fractured my leg, it’s a tiny hairline fracture, but the bruise is enormous and is the part that actually hurts. It even hurts just to lie here. But the frustrating thing is that I’ve been reading cookbooks and watching tv and have a million new recipes flying around in my little head but can’t make anything. I’m sad. I think the new puppy is already bored of me too which doesn’t help. In reality I have it pretty good… I’m snoozing whenever I want, my mum delivered a lovely lunch to me and some dinners and brought me loads of magazines and I’m spending my time planning this years Christmas (there only 61 days to go after all). For obvious reasons I haven’t created much in the way of new culinary delights recently, so while I’m not allowed to move and can’t cook, I am going to post about the items that I have made in the last month that I have just simply not had time to blog (until now). While my father was staying with us, I made dishes that he had seen on the blog and adapted others. I made a yummy fish pie, which was a challenge may I say. It had to be salt free, shellfish free, stock free and without citrus! Several soups were made (accompanied by my Tomato, red onion and fennel bread of course), there were meatballs, Boeuf Bourguignon, and my chocolate torte for sharing. 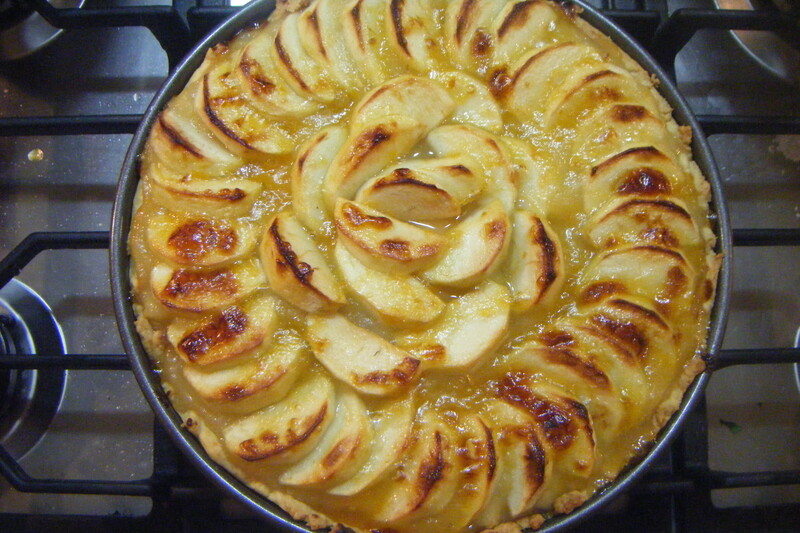 But one of the first items I gave to my dear old pop was apple tart. 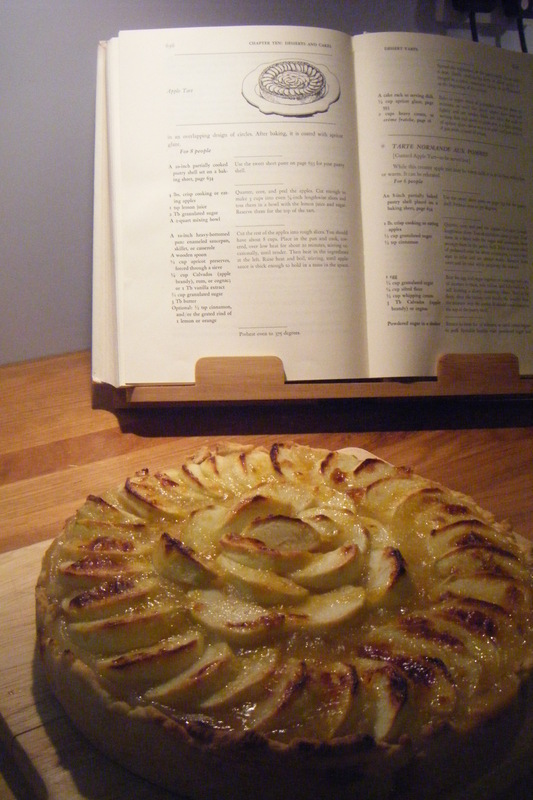 It was inevitable that I would make an apple dish of some kind. 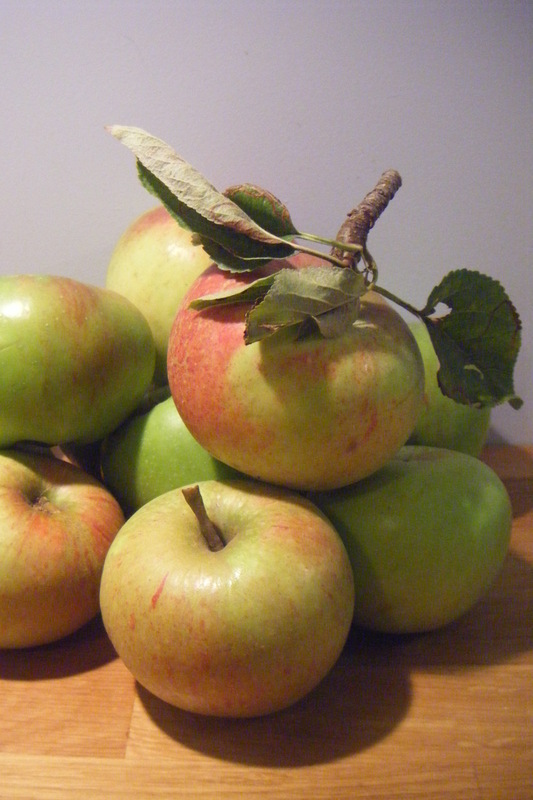 It is the season of apples after all and my mom does have several trees in her garden. I’m not a cooked apple lover I have to say. I have made many many apple pies over the years but never a tart. So I thought I’d try this one. I received in the post my birthday present from dad ‘Mastering the art of French cooking’ so equipped with this I made Tarte aux Pommes. It was certainly very nice but I am still not a cooked apple lover I’m sorry to say, but the people who shared this said it was lovely, so I’m going with that. This is a classic French apple tart, which consists of a sweet pastry shell, a thick rich apple sauce and topped with a layer of apple slices and apricot glaze. I don’t usually measure in cups but I wanted to actually follow the recipe (most unusual for me) that is found in ‘Mastering the Art of French Cooking’. I did leave out the lemon and orange out of habit as certain family members are allergic to them. Preheat the oven to 180°c (fan oven). Start with the pastry. Place the flour in a medium bowl, mix in the sugar and salt. Add the butter and with your fingertips rub the flour mix and butter together until it reaches the consistency of breadcrumbs or oat flakes. Add the water and blend with one hand to form the mix into a rough dough. 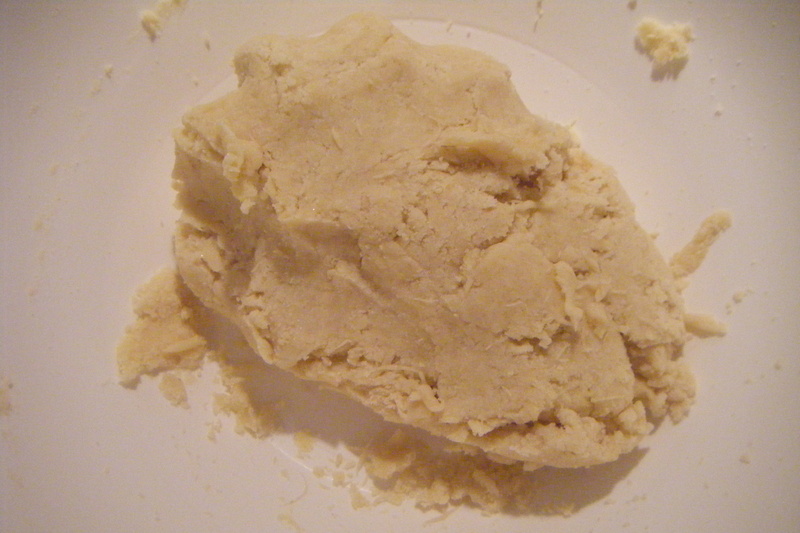 Kneed this dough briefly until it is a fairly smooth round ball. And chill for an hour in the fridge. Once chilled, roll our and line a 10 inch loose bottomed tin. And using baking beans, partially cook (blind bake) until set. 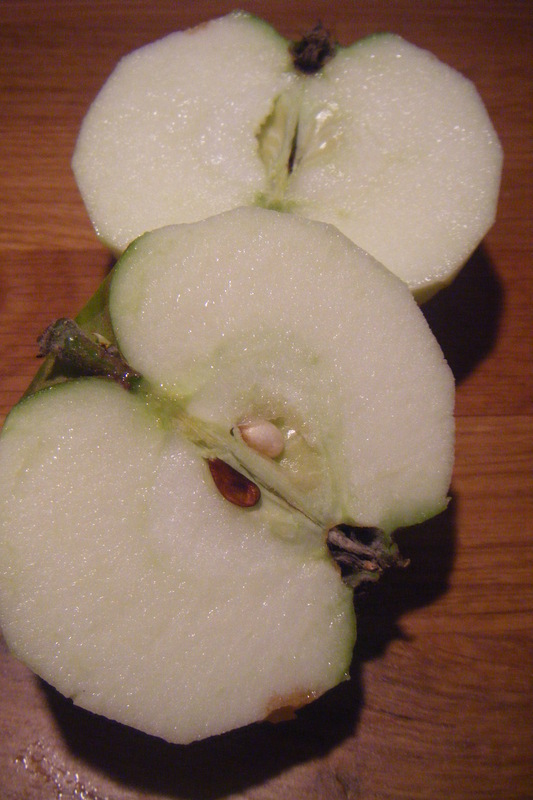 Peel, core and quarter the apples. Reserve about 4 large apples for the sliced topping (you can slice these now and cover with clingfilm). Chop the remaining apples roughly. There should be about 8 cups of chopped apples remaining. Place the 8 cups of chopped apples into a big saucepan. Add a tbsp of water and cook covered on a medium heat for about 20 minutes, until tender. Add in the apricot jam, rum, vanilla, sugar, butter and cinnamon and bring to the boil. The mix should be thick and glossy. Take off the heat. Spread the apple sauce over the base of the pastry shell. 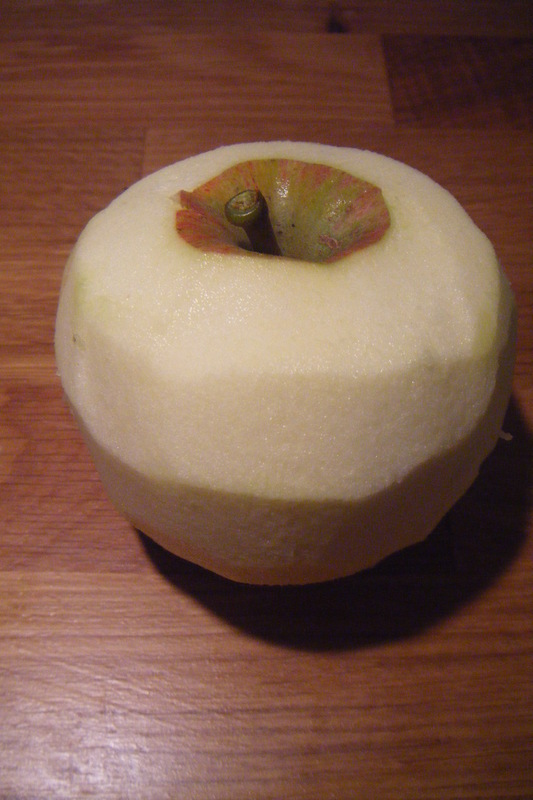 Cover with a layer of sliced apples (the reserved apples) arranged in a spiral. Glaze with melted apricot jam. This technically should be done afterwards but I jumped a step by accident and well it didn’t turn out too badly. You can glaze afterwards if you prefer and probably should. 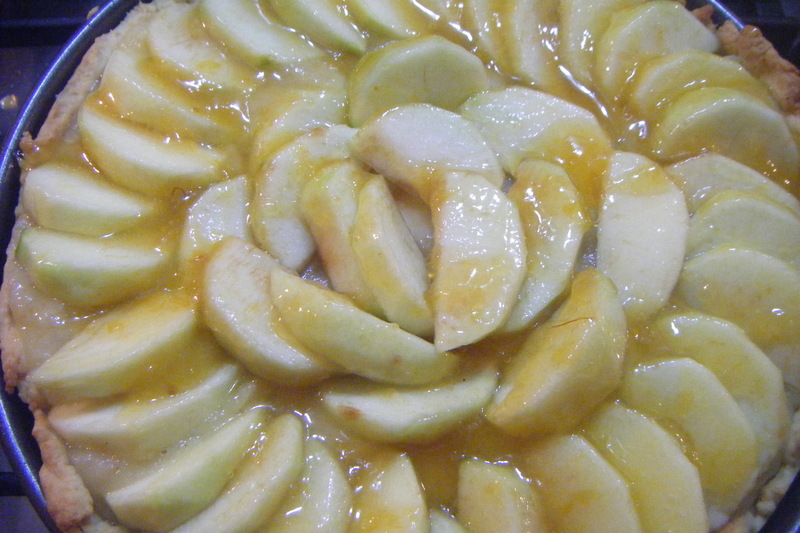 Pop into the oven and cook for 20 minutes until the sliced apples are golden and tender. Cool in the tin slightly (5 minutes) and then remove from tin and place on cooling rack. Hope your hairline fracture heals quickly and with as little pain as possible. Thank you so much Janet, it the big wide world, my fracture is only a minor thing but it is a nuisance.Hopefully in a few weeks I’ll be back to my old self.